Be a part of the Annual Urbanbaby & Toddler Magazine Cover Contest 2013! Winning child will win a feature cover in our Urbanbaby & Toddler Magazine Fall 2013 and over $1400 in prizes. 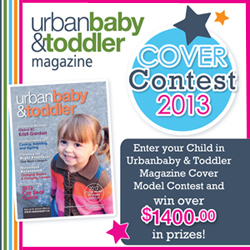 Enter your child in the Urbanbaby & Toddler Magazine Cover Contest 2013. Voting starts online on Monday, May 27th, 2013. All entries receive a one year subscription to Urbanbaby & Toddler Magazine. Enter by mail, drop off or online. Complete contest details: http://www.urbanbaby.ca/coverphotocontest/ and on page 14 & 15 of the Spring 2013 magazine issue.